As many of you know, I am a pickle-lover. But there are pickles, and there are PICKLES. Over the past few years I have been learning about the benefits of fermented pickles which differ from hot-packed and boiling-water-processed pickles which are made with vinegar and sugar. 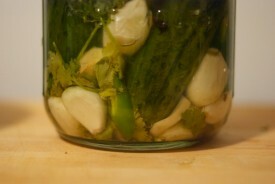 Fermented pickles are preserved through a natural process which occurs when vegetables mix with salt or brine and the resulting environment is hospitable to lactobacillus. Lactobacillus are helpful bacteria which help create many of the fermented foods we enjoy, like yogurt, sourdough bread and pickles. Adding naturally fermented and lactobacillus-rich foods into your diet helps support healthy digestion and increases the availability of some nutrients in the pickled vegetables. I love fermented food and drinks, like wine, beer and kombucha. I always have a stash of Adamah pickles in my refrigerator and when I go to any farmer’s market and I see lactofermented ANYTHING I buy it. To support my habit, I recently started playing around with fermenting on my own. I started with the “gateway drug/ferment” of sauerkraut, and experimented with a variety of flavorings. I did a more Asian/kimchi-esque kraut with shredded ginger and hot peppers, and I did a plain one with mustard seed. 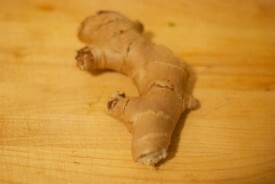 Both were incredible and easy and tasty and nutritious. 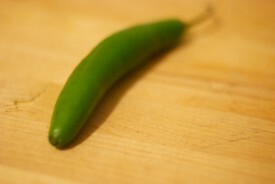 If you read this blog, and followed my quest to hot-pack pickle something every month of 2010 as part of Tigress’ Can Jam, you might remember this rant/panicked post about my irrational fear of botulism. Because I still harbor that fear, I was thrilled to learn that no one — not ONE single person — has ever became ill from a fermented pickle! Yes, one should consume fermented products in moderation, and yes, one should be sure to wash the vegetables first and use clean jars, but according to this Fresh Air interview with fermentation guru Sandor Katz, fermentation is safe… ALWAYS! In other words, I’m in! After experimenting with cabbage fermentation, I was ready to dive into full-vegetable pickles. 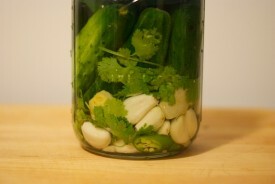 I was excited to make a classic sour pickle after finding local NJ kirby cucumbers at Fairway Market. I referred to Sandor Katz’s new bible of fermenting, The Art of Fermentation, which I ordered earlier this year. 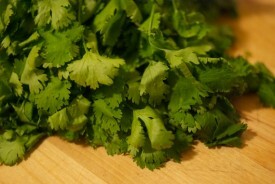 I looked around to see what other ingredients I could use flavor the pickles with and came across a nice looking seranno pepper, ginger, garlic and a bunch of cilantro from my CSA (this post was started over the summer – and posted now in November. Oops.) I decided to make a Thai-flavored cucumber pickle. 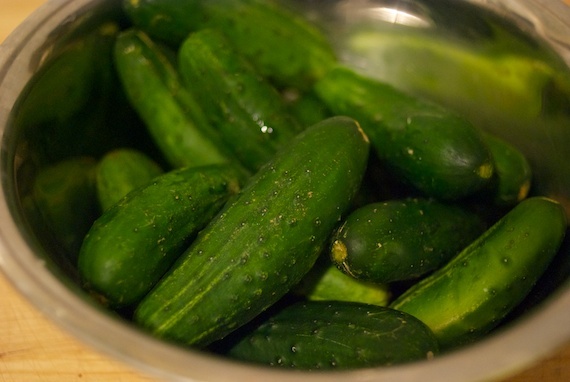 Sandor Katz recommends adding a tannin-rich element to the jar when pickling whole cucumbers, which tend to get mushy while they ferment because of their high water content. I didn’t do this, however, knowing that I would eat them quickly after they were done. Mine didn’t get mushy, but maybe I was just lucky and I did eat them pretty quickly. Maybe next time I will add a tanin-rich element incase it was just luck – he suggests grape leaves, oak leaves, a tea bag, or a green banana peel. While traditional sour pickles are pickled in wooden barrels or fermentation crocks, I’ve been using large Ball jars which work just fine. For these pickles, I placed the whole, peeled garlic, sliced peppers, washed cilantro and sliced ginger on the bottom of a jar, added the scrubbed kirbies, and topped with 5% salt water brine. The ratio to make a 5% brine is 3 Tbsp of salt per liter of water. I used kosher salt, (Sandor Katz uses unrefined sea salt, but agrees that any non-iodized salt will do) and Pur-filtered and pre-boiled and cooled NYC tap water (I attempted to remove the chlorine from the NYC tap water, but it’s unclear if it was removed; the pickles didn’t seem to suffer). 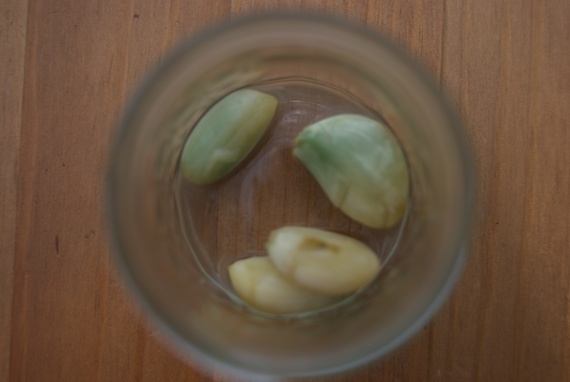 Once everything was in the jar, I pressed the cucumbers down and made sure that the brine was above the top of them, loosely placed the screw-band on the jar, and kept the jar on the countertop. Every time I passed the jar over the next few days, I vented the buildup by opening the jar, pushed the cukes back down under the brine, and after about two days, I started tasting and (because I love a science experiment) testing the pH. 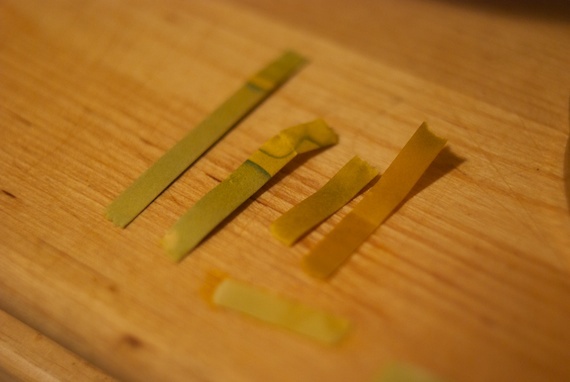 The color of the strips changed over three and a half days from a basic green to an acidic orange and eventually yellow. The taste also became less salty and more sour. Since I was fermenting these pickles in a NYC apartment in mid-July, it took all of 4 days to fully ferment, at which point I transferred the jar to my refrigerator, from where I pulled out a kirby daily for a snack or side to my meals. 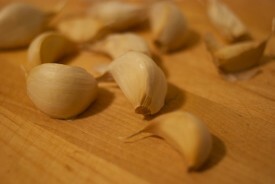 One thing to note was that some of the garlic turned bright blue during fermentation. Electric cyan not being a color one generally sees in a natural cooking environment, I turned back to Mr. Katz to see if I was going to turn all blue à la Violet Beauregard if I ate it. 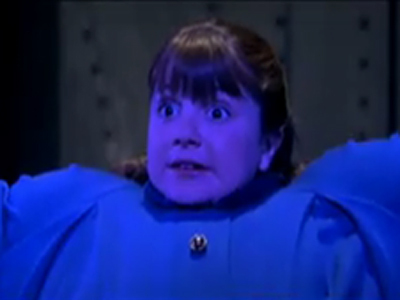 It turns out the blue garlic reaction is a common and HARMLESS one which occurs due to compounds in the garlic which react to trace amounts of copper in the water. The picture to the below left is at the beginning of the fermentation, and at the bottom right, after 4 days. You can see subtle changes in the color and texture of the vegetables. 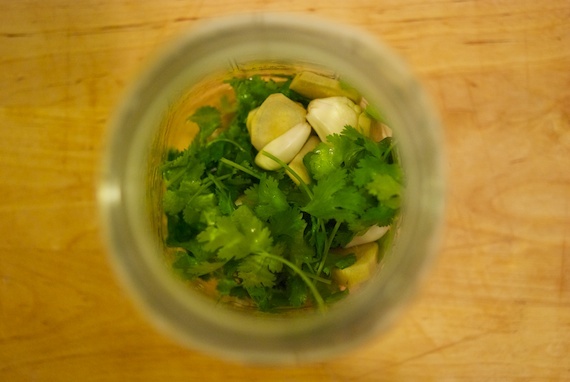 In terms of ease, fermentation is pretty hands-off and once the vegetables are prepped, a small time commitment for something so healthful and beneficial. Look for more posts about my home fermentation experiments soon and comment below on any fermentation tips or questions you have. Great Post I typically hot pack or Vinegar pack my Pickles. I’ll have to try gherkins fermented like this. One tip i found was to drill a hole in the top of a canning jar lid and insert a cheap winemaking air lock. A bit of melted wax seals the join and saves you having to release the gas.